Credit again to Snappy Little Fingers, both for bringing back the wacky cassingle artwork of my youth and for sending over a copy of this tape to review. I was pretty excited to pop this guy in when I opened it up. After all, I'm a pretty huge Hooper fan and I've enjoys some of Spells prior work as well. As far as the Hooper side goes, I have to admit I'm a little disappointed. They start off with a cover of Marissa Nadler's "Diamond Heart." It's alright, but is really lacking the energy and hooks that have made Hooper one of my favorites. But again, it's a cover, so you can only do so much. I had much higher hopes for the second song on their side of the split, "My Friend The Beast." Best I can tell, this isn't a cover song, but it really doesn't sound much like the Hooper I've come to know and love. The tempo is slow and deliberate and aside from a few high spots towards the end, the song just feels kind of thin. Not at all what I was expecting from these guys. For their side, Spells sticks to the tried and true. "Starch Ideas" is the best kind of upbeat chord progression pop. Through in a nice hooky chorus and some nice backing vocals and you've got a really solid song. For their second song, they provide "A Failure's Wake." The title makes me wonder. Do they mean a wake for a failure, like the failure died or do them mean the wake of a failure, like the wake that a boat causes. Either option provides some interesting thoughts. Like "Starch Ideas," this is another bouncy, catchy song. 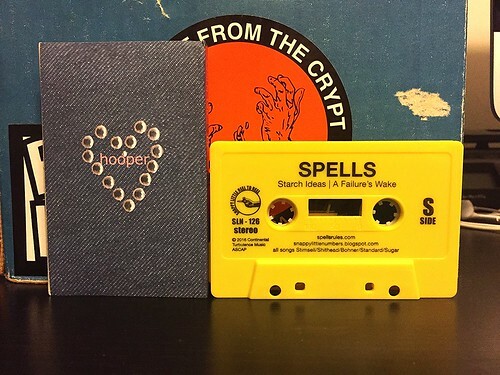 I really didn't expect the Spells side of this tape to be the one that I liked the most, but there you have it. This is an interesting little split. I'm especially curious to see where Hooper goes next. Is this a new direction or just an anomaly?